That week I'd talked about having off? I had one day of it...and then started back to work, worrying about how near the Easter holidays were...by the time that the week ended I realised that was the wrong thing to do - I had even bigger bags under my eyes and absolutely nothing to show for it except a week of half-sewn things filling the bin. To add to this, one of the Teacakes had a most traumatic week at school and Mr Teacakes broke his leg playing football (yes, he acquires broken body parts like others eat meals)...by Friday I was ready to take to my bed and howl. But as we had lovely friends visiting from London I didn't do that, but did decide that I really would take a few days off this week. So I have been going to bed by 10pm and reading Leaving the World , which Mr Teacakes insisted upon so that we could begin our own two-person book group (I already go to one with more people...but as it's all girls this holds no interest for him...the books we will read together are decidedly more male in tone), and which I wept my way through, which did nothing to alleviate the appearance of my tired, puffy eyes, despite being a gripping and wonderful read. I then read Days of Grace which my sister edited. Knowing that I rarely seem to make time to read now, she cherry-picks things which she's certain I will love - again, more crying...but so beautifully written around such a wonderful story that it was worth it. And then yesterday I went and met Mr Teacakes' lovely mother at the Quilting exhibition at the V&A. It was the most interesting and riveting exhibition...for once I actually wanted to read all those little explanation pieces that they put beside the exhibits and the quilts on show were absolutely breathtaking. Many were from the 18th and 19th century and what struck me was that I hadn't been aware of how accessible such beautiful and modern-looking fabrics had been available to quilters then. Quilters traditionally seemed to use far more silks than we do now in our quilting and I wondered how we have got to this place of using almost exclusively cottons to quilt with...it's such missed opportunity to confine ourselves to quilting-weight cottons when you see the richness that the silks and velvets bring to a piece. Obviously they also relied upon hand-quilting, and again, I felt like I wanted to race home and then make something in a completely different way and at a slower pace (yes...I appreciate that in keeping with that one should not 'race' home, but really, it was so enthusing to see the beautiful work on display). 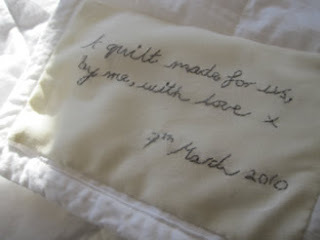 I've always felt that quilting was the one area where my sewing doesn't need to be absolutely perfect (I don't mean that my other sewing is perfect...just that I aspire to this and can drive myself to distraction trying to get things to be this way) - there's something about a quilt and the cocooning, swaddling nature of it that feels as though it should have character and care sewn into it and that if one attempts to iron out every flaw then there is a danger that something not quite so capable of conveying love and warmth might be created. It was affirming of this to see the imperfections in the intricately-pieced quilts, as though with these you could better imagine the real person who might have created the stitches that bound it together. The other truism that I've always harboured is that, just like making soup, I imagine that it's impossible to feel truly angry when quilting. It's odd, but I've found that both these activities seem to dissipate anger and negative thoughts (does anyone else have this?) and bring about a feeling of warm, cosy comfort. So how alarming to see that one of the 19th century quilts that was so perfectly and delicately pieced, had some angry text embroidered concerning the king using strands of hair taken from the quilter's own head - it rather turns my theory upside down...how disappointing. My sister (sender of all good things) had ordered me the companion book to the exhibition a couple of days ago with strict instructions not to look at it before I went. I did have a small peep with her permission, but actually I can see why she didn't want me to, as it's only after seeing the breathtaking beauty of the real thing that I had the desire to gobble up every word and appreciate fully what is being written. 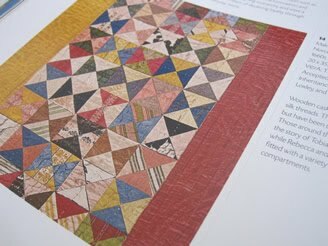 (Although the book is beautifully photographed the pictures don't do justice to the actual quilts and so isn't a substitute for making your way around in person). There were several things that I found really interesting - one of which was the quilts made by injured soldiers during the war or active soldiers in an attempt to occupy oneself in ways other than gambling and drinking. These had a precision and symmetry and attention to geometric shapes that was different to the other quilts on display - they seemed entirely male, and my mother-in-law made me laugh as she noticed that one soldier had embroidered his name not just on to one corner of the quilt, but on to every panel that made up the quilt. 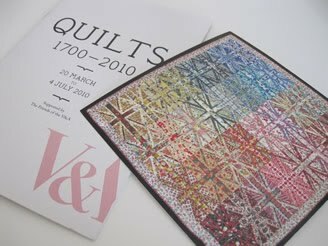 The other area I found interesting were the modern-day quilts that had been created by prisoners as a project commissioned by the V&A. The quilts and panels were all created in direct reference to being in prison and what that meant, and were invariably beautiful and incredibly touching in a very direct, unpretentious way...it felt both odd and also very right. But it didn't all sit quite so wonderfully with me. Aside from the absolutely beautiful Liberty Jack shown at the top of this post, I felt that the choice of modern quilts on display was....really very odd. Tracey Emin's bed was on display, which was somewhat expected, and there were some really interesting well-executed pieces (such as quilt made up of miniscule white squares, with just the occasional miniscule photo dotted about...the blank squares represented the thousands of unnamed lost soldiers) but the other modern quilts seemed to also be 'art' or 'statement pieces', rather than examples of what the brilliant modern quilters of today are producing, such as Kaffe Fassett. Any sign of this was completely lacking and it felt like an unrounded (is that a word? I'm meaning the opposite to well-rounded and fully-formed) exhibition because of it. 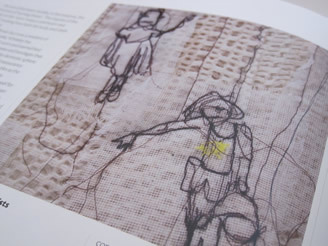 There was a foetus quilt created as a reaction to American abortion laws, plastic legs sticking out of a sewing box to represent children given up for adoption and placed in care, and figures scrawled across a quilt, their limbs conveyed by dangling threads to represent children facing poverty and hardship...all things that are worthy of a social and artistic reaction...but things that also seemed out of place within the context of the exhibition...these artistic reactions cannot be the sum total of modern quilting today and yet that's how it came across. Perhaps though, that's coming from the viewpoint of someone who had gone to the exhibition wanting solely to admire the skill of other sewer's work and to be inspired herself. I wonder how non-sewers viewed the exhibition and whether this worked for them. 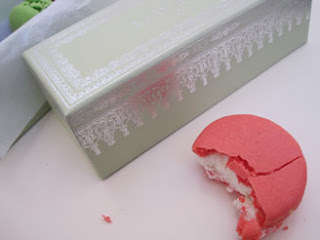 Lordy, the words to pictures ratio for this post has been quite alarming - I'm so sorry to have left you with so many unadorned words to work your way through. 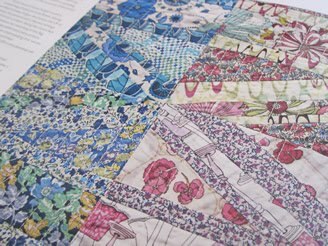 Thank you so much for all the wonderful giveaway comments in my last post - I'm loving reading them - you still have time to comment if you'd like the chance to win some of Rosalie Quinlan's My Grandmother's Flower Garden patchwork squares and I'll hopefully announce a winner later in the week. It seems from your comments to my last post that My Grandmother's Flower Garden isn't easily available in any country...which only makes me more happy to be able to share a small bit of it with someone. I have cut a 4.5" charm square from each design, to give you 16 squares, hopefully enough to make a patchwork cushion with...or anything else that's small and patchworky that you might dream up. I've tried to centralise any patterns for you so that they'll look good and be easy to use. So here it is: a very tiny giveaway, but one that will be light to post, so I'm happy to post it anywhere, and hopefully it can be made into something bigger and more lovely once it's reached its destination. 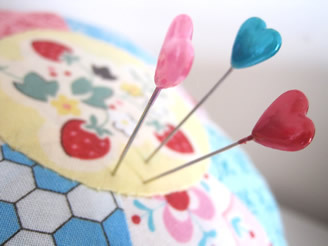 I've snipped into the fabrics myself last night and came up with this pincushion. I've been thinking about Dresden plates ever since seeing this flower here - it's virtually impossible not to be inspired and propelled towards your own sewing machine immediately after looking at Louise's work...if only in the vain hope of creating something half as lovely as her stitchery. I find that almost everything she sews I wish I'd made myself. Dresden plates are thought to have taken their name from quilters who were inspired by the beautiful floral porcelain that had come out of Dresden, Germany (which during the 19th century was at the centre of the romantic art movement) although it's thought that the fabric Dresden plate didn't emerge until around 1920. I researched this simply because I found the sound of the name 'Dresden' most unfitting for something so lovely looking, and felt desperate to know how this incompatible naming took place...but I do like things to have history, and now that I know the name sits more comfortably in my head. So last night I created the actual plate and this morning I turned it into a rather obese pin cushion. The maths involved in creating the pattern pieces to make the petals hurt my head quite horribly...but this is so good for me, because while maths was something that I had no interest in at school, I can now see the importance of understanding angles and so I'm relearning it with rather more enthusiasm than I had for it the first time around. I try not to ask Mr Teacakes, who is something of a maths wizard, to do all these things for me, as it feels so important that I can work them out for myself. I somehow found the construction stage more pretty than the finished item with this project...I loved how all the pins looked splaying out in a circle around the petals. 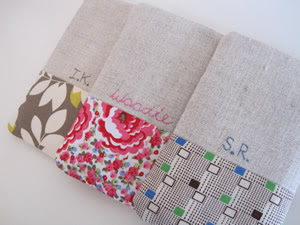 Let me know if this is something you like the look of making and I'll try and whip up a (free - yippee!) tutorial for it at some point...although I think in future I would make this pin cushion quite a lot smaller as it looks as though it may have been genetically modified at its current size. 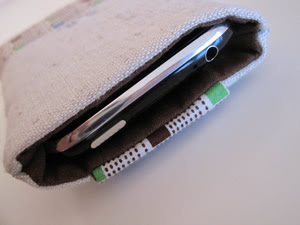 It has little pleats toward the bottom so that the lower circle fits in easily. belcones - this term refers to a cat's front legs and would be used as such: 'my, my, what fine belcones you have, Tabitha'. wackering and cornerish - to feel apprehensive and worried about doing something. trotters, paws and chops - all references to body parts - feet, hands and cheeks respectively. winneting, winnet - if one is 'winneting about' it means that they are being frustratingly indecisive...thus a person being unable to make up their mind about which restaurant they'd like to eat in later may be told to 'stop being such a winnet!'. There are others that I'd thought were family words, but have since realised that they are not...just very rarely used phrases. 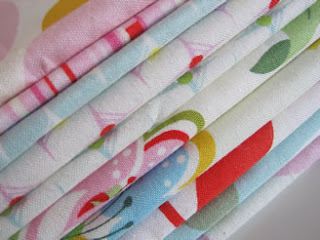 I already knew that I had found a kindred spirit in Joanne from the moment I chanced upon her blog a couple of years ago, but when she once uttered the words 'oh, lawks!' I knew that she truly was from the same pod. Anyway, lurkers, newbies and old lovelies (that means long-time commenters, not old ladies...although they're really welcome too) are all welcome. 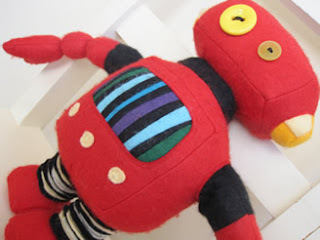 Thank you so much for all the lovely comments about the robot and also for the suggestions about attaching arms (if you're thinking of making one yourself then do check the comments on my last post, as there are some good ideas in there). I have started a Flickr group called Flossie Teacakes Patterns & Tutorials: Made by You (yes, it's a short and snappy title) where I would love it if any of the sewers who have used one of my patterns or tutorials wanted to upload some photos of the finished makes - it makes me so happy seeing these and it would be lovely to have them all in one place. I love the different results that can come from a pattern - seeing the lovely fabric combinations that people have chosen or the places where the original design has been changed to make it very much their own (and often even better). Anyway you can find the pool here on Flickr and I've also put a photo link to the pool in my side bar: eyes right. And as mentioned in the last post, at some point very soon I'll do a post about some of the lovelies that I've already been sent photos of. 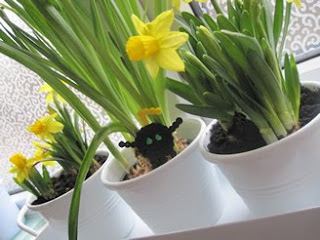 I am so enjoying my week off...I have sanded and oiled work surfaces, tables and chairs and planted daffodils in pots of the kitchen windowsill. I love the little black, green and yellow alien that is sitting in the middle pot. Dinosaur-boy made it for me a couple of months ago using Hama beads and it seems so full of character. I have also been baking bread from Artisan Bread in Five Minutes a Day that I mentioned in my last post. 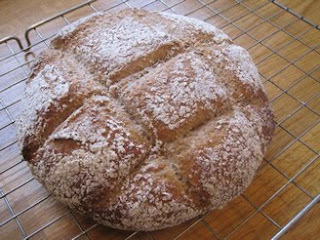 The authors say that you must crack the basic dough recipe before moving on to any of the others...well, I didn't quite manage either of those things, as I realised that I didn't have any plain flour left only once I'd started measuring some of the other things out...so I made wholemeal bread instead, using their method and my wonky recipe. One of the things that the recipes focus on is having a crackling crust and a chewy centre. The crackling crust is partly created by having a broiler in the oven to generate steam...not having a broiler, I filled up a big stoneware dish and let the water sizzle away in there. I was amazed at the difference this makes and the crust really was crackly (just like bread made by real artisans...I'll let you know if I ever turn into one of those, but it could be some time) The inside felt undercooked by a minute or two to me, although everyone else loved it...I also felt it was slightly lacking in flavour, so I'm going to do some tweaking on my next attempt, which will be at 6.30am tomorrow morning. 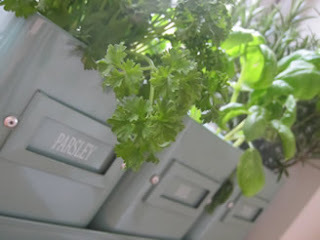 I have also been getting my windowsill herbs in order, which seemed to have died off over the winter. I have also had the Little Teacakes at home for an extra day when we made kites, laminated them and then took off to the park in the drizzle to fly them...it was lovely as there was no one else there and they did fly despite the rain as if you run down a hill fast enough things do tend to flap up behind you, which was good enough to make us feel that they were completely successful. I have also finally got Rosalie Quinlin's Grandmother's Flower Garden range firmly in my paws, a belated birthday gift from my Mama. 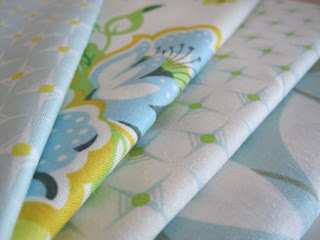 We ordered them from the States as it was just about impossible to find the range in the UK and the rarity of the fabric meant that where it was available the price was too prohibitive to actually buy any of it. The package took three weeks to arrive as it got delayed in customs and incurred a £19 charge - eek! 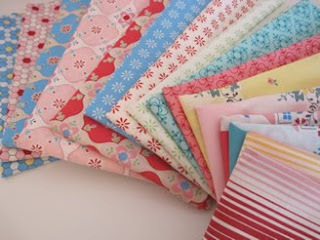 Anyway, it feels far too lovely to hoard all to myself, when it's so elusive in this country, so I'd love to share a small bit with you...I was thinking that a little charm pack of squares might mean that someone could make a patchwork cushion or something else lovely, does this sound good? I'll have details of that in the next couple of days, once I've had a chance to cut some squares. I've completely fallen in love with the little houses and teapots that pops up in one of the designs. 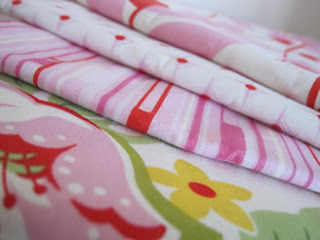 And these selvages! 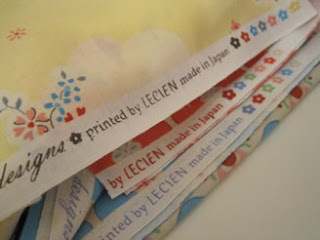 Lecien always tend to do gorgeous ones, but I'd forgotten this and suddenly saw them today when I unfolded a piece. 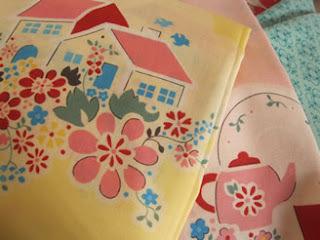 I do hope Rosalie is aware of her own utter fabulousness to be capable of designing such an amazing range...it's completely magical and nostalgic of childhood. I can't wait to get some into Zebra-girl's room so that it might become woven into her own childhood memories. 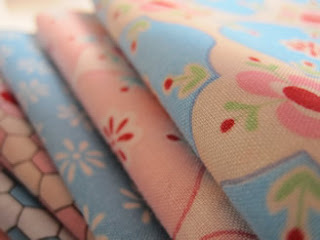 I have also been doing a spot of dressmaking....or skirt making, at least. This time, somewhat optimistically, a summer skirt. Making it has brought up lots of thoughts around the matter and so that will have to wait to be a whole separate post of its own. Thank you so much for the quilt love and also to all those who have bought the Tabitha Bag patterns now that the selling rights have been changed. It is making me feel hugely happy to think of them occasionally popping up on Etsy and elsewhere. So many lovelies have sent me pictures of bags that they've already made over the last 8 months and I'd love to be able to share some of them on my blog, but it always feels like an imposition to ask directly - if you're happy for me to do this then please do drop me a note or let me know if and when you send me a picture. 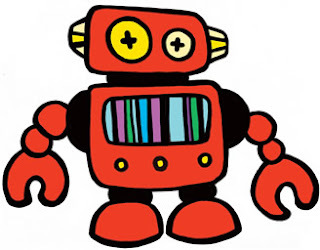 Anyway, I want to introduce you to Robbie the Red Robot who will hopefully materialise in book form at some point later this year. A month ago I received an email asking me if I'd be interested in making a 3D prototype of Robbie from the illustration provided on his website here. People always surprise me with the things that they ask me to make, but this was a different idea altogether again, as I've never made anything to mirror someone else's design. Happily, it's a fantastic design and so it felt like a complete privilege to attempt to copy it in fabric form. My initial excitement had its own crash-landing when I started to think about the logistics of putting Robbie together. Long time readers may remember the hedgehog debacle and the way in which my brain is not naturally wired to think in 3D when it comes to stuffed toys. The problems were many-fold (two-fold not quite covering them). 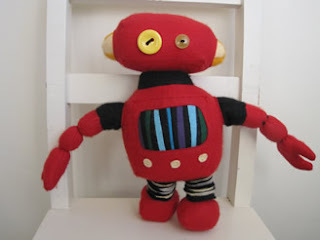 The only successful soft creatures that I'd made in the past had arms and legs attached with buttons, which worked in the context of bears and elephants, but would have felt unsuitable for a robot and thus an admission of my own incompetence not to attempt an alternative. A robot by its very nature is broken down into angular, compartmentalised body sections and my mind began tying itself up in knots regarding what order the body parts should be made in and how to attach them to one another and how and at what point to turn him right side out for stuffing. The felts, ordered from wonderfully helpful Laura at Lupin took a few days to arrive, which gave me plenty of thinking time and room to wake in the night with ideas as to how the problems with 3D Robbie could be overcome. I sometimes ponder how wonderfully well I'd sleep if I didn't sew - every single garment of clothing I've ever made means that I sleep for several hours less every night until it's finished as I become obsessed with thinking through the construction and the night before last I woke up at 4am with a eureka moment over how to join the piping neatly on a bag that I've been working on: be still, frantic mind! Anyway, once I had my paws upon the felt and started assembling body parts it all gradually became clearer...so just in case you are thinking of entering into some robot construction yourself, here are the things that worked for me (and you might want to, for I was absolutely amazed by the Little Teacakes' reaction to him - they completely fell in love with him and it made me realise that I had previously failed to appreciate how very loveable a robot can be). One of the problems with the creatures that I've made in the past was that you could see the little stitches where their heads were attached to their bodies and I found this most upsetting. I wanted Robbie's head to feel more stable and rooted than a simple neck perimeter of whip-stitching would allow. My way around this was to machine-stitch strips of velcro onto the centre of the space where the neck and head were to join - this keeps the two pieces more firmly anchored together and allowed me to do really tiny stitches to join the two (the photo above shows the finished neck join...this was the bit that I found most pleasing!). 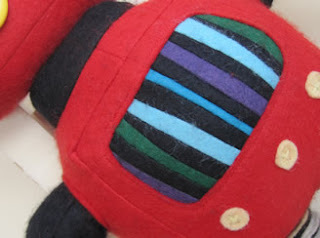 The legs were created using two narrow, densely wadded tubes of black felt, followed by sliding felt discs onto them to cover any joins where stitching might show. 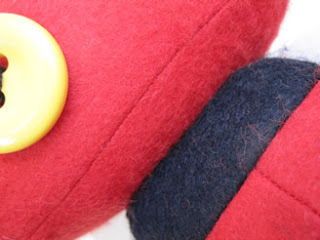 The arms, legs and ears were all attached by cutting a hole in the felt, sliding the felt tube into place and then top-sewing around the hole. This worked really well for the legs and ears (do robots have ears? I'm not sure what the little yellow bits should be called), but was less successful for the arms. I couldn't find a way to angle them so that they did anything other than sticking out at right angles. This was slightly overcome by under-stuffing the tops of the arms but they remained the part or the robot that troubled me and made me feel there was room for improvement by someone more skilled in the soft-toy making department than me. The felt, which was beautiful to sew with and feels lovely, did become slightly fuzzy where it was over-worked during construction. I'm guessing this may be because of the wool content, but the fuzziness feels like a worthwhile compromise when the alternative is a less tactile acrylic felt. 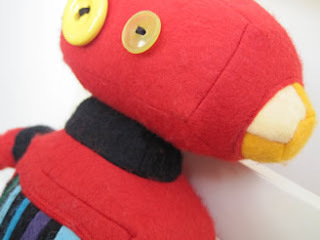 Dinosaur-boy has already put in a request for me to make another robot for his birthday...this may or may not happen for, selfishly, I'm back to thinking about clothes. You may remember that I mentioned that I have finally found a mannequin that mirrors my bizarre measurements and I am so desperate to get a chance to make something from it, and yet Made by Florence work has kept piling up and the time never seems to come (photos of the mannequin are coming, Pipany...but it's not pretty, just practical!). Last week Mr Teacakes jokingly told me that I am entitled to 25 days holiday (I realised that I think of the Teacakes' school holidays as being my holiday...but actually I work every evening when they're off) anyway, my mind ran away with this idea as I'd never thought of it quite like that and after finishing off a few bits and pieces for custom orders I am now taking a week off (although I will most likely still be blogging as I'll hopefully work on making some more clothes for myself and will be keen to report back). My holiday officially started today and I spent the day doing all those lovely things that I don't normally get around to doing, like sanding back and oiling the wooden work tops and planning bread to make from this lovely book, Artisan Bread in Five Minutes a Day that I kept seeing recommended all over the place (I think Mary-Beth is a big fan...and I aspire to do as much baking as she does). The book has thick creamy pages and clear instructions...but those US references to cups and quarts are foxing me, so I'm off to find an online measurement converter. P.S. 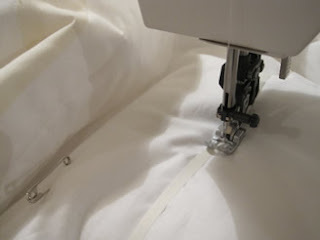 The 4am eureka moment idea for the piping actually worked...which would have meant that yesterday was lovely had I not taken to habitually ironing fusible interfacing onto the iron instead of the fabric...over and over. How can one make the same mistake so many times...perhaps because I love the smell of this iron-cleaner so much? P.P.S. Lisa's book is now on Amazon...I've already put it on my wishlist despite a lack of cover to tempt me...even that blank 'awaiting image' square is sizzling hot...I can't wait! Yipppeee! Thank you so much to all those lovelies who have bought a copy of my Lis iPhone Holder PDF. I've had several emails regarding selling rights for my patterns as I had said that I was happy for holders made from the Lis pattern to be sold by small businesses, whereas previously I'd said that any bags made from my Tabitha Bag pattern were for personal use only. It seems too higgledy-piggledy and confusing to leave things that way, with different patterns having different selling rights, and far easier to update this to say that my blanket rule is that I'm entirely happy for small, independent businesses to sell things made from my PDF patterns (including the Lis iPhone Holder and the Tabitha Bag) as long as my pattern is credited in your item description if you're selling online. I hope that clears things up for you. It may take me a while to update all the Tabitha Bag pattern pieces and information to reflect this (as the original document is currently on a broken hard drive - arg! ), so if you receive the PDF in the meantime, please feel free to ignore the 'for personal use only' references. Anyway, back to the photograph at the start of this post. 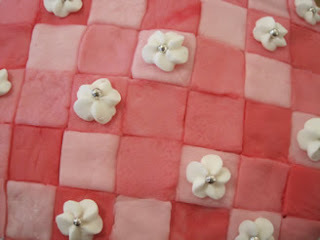 This is the quilt that I made for my and Mr Teacake's room. To someone who loves quilting for all its myriad of colours and the way the patches of fabric mingle and play off one another, this quilt may well be the epitomy of 'dull' and I can understand that. It is, however, something that I've wanted to make for the last year or so and its lovely fresh whiteness and occasional snippets of cream make me feel truly happy. Because I work from our bedroom and all my fabrics are stored in there I seem to have a never ending line of people visiting...some of whom I know well, others whom I've never met before who are the friends or relatives of other local Made by Florence customers. All our bed linen is white and I've found that even if it has all been freshly laundered and ironed only the day before, somehow the pillows never look completely unslept upon and there's something horribly vulnerable about someone seeing where your head lays at night (yes, more so than where your actual body lays, I think). 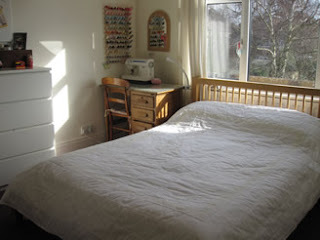 A big, white, bed-enveloping quilt seemed the answer. I encountered several problems while making it...the first was that I'd never made a double quilt before (although actually this was bigger as I bought Queen sized batting which measured 108" x 93") and had no idea quite how much space is needed to lay one out and pin the quilt sandwich together...even my daughter's room (I'm unsure how she ended up with a bigger room than ours) didn't have quite enough floor space. I finally had to move the dining table to a different room, which made the Little Teacakes dance up and down with delight as they love things being moved around. I used Quilter's Dream Puff for the batting, which has a 1/3" loft and is incredibly warm and, importantly, is completely white, so as not to discolour the cotton that was to be put on either side. I haven't used a synthetic to quilt with before and initially was most disturbed by it. I had always dismissed as being a little fusspotty that hilarious selling point so often written on wadding packs of 'does not beard'. However, working with something that does 'beard' every time you try and smooth it prior to pinning was quite maddening and I can see why the clean shaven batting holds such appeal (also if felt horrible to touch...most unnatural). 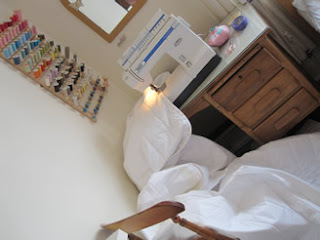 However, once it was all pinned, the Dream Puff gradually began to win me over as it was easy to sew through and the quilt felt light, warm and cosy once sandwiched by cotton. Instead of using disappearing ink to mark out the quilting lines, I bought some of this 1/4" quilter's tape that you can sew alongside. It was moveable and quick to use and so it seemed like £1.95 well spent (you can see it in the picture as the narrow cream line...it blends with my design quite well, but I don't think it normally displays such chameleon tendencies). I quilted the middle of the quilt with widely-spaced vertical lines and then for the outer sections I followed around the cream rectangular border with more narrowly spaced lines of quilting. I'm unsure how I fitted into this picture, but I can report back that my memory of it was that it was cosy! My verdict on the wadding is that I love it - it is so toasty and light and feels far more snuggly than Dinosaur-boy's quilt (which I've realised that I still haven't got around to blogging about...just in case you want to know right now, I used Warm and Natural for his quilt, which I really dislike as it seems to me to give a disappointing finish compared to Hobbs Heirloom batting). It doesn't quite have the amount of loft that is promised on the packet, but is more lofty than most. I chose not to pre-wash my cotton so that it would shrink a little on the first wash to give it a more antiqued look and was really pleased with this: an even shrinkage that makes the quilt look more pouffy. The other thing that I hadn't counted upon when I set out on making this was how much it would cost...a Queen-sized quilt is just so vast. 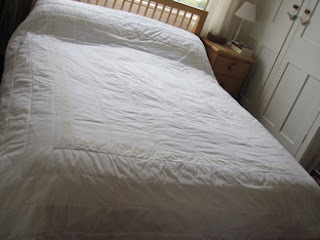 For the reverse I used an egyptian cotton flat sheet that I picked up in the sale, which at £30 was less expensive than it would have been to buy the same quantity of quilting cotton. I was worried about how this more densly woven egyptian cotton would quilt and shrink, but actually, it's fine on both counts and it was a cost-cutting exercise that paid off. Hurrah! Over the course of the last month I've been beavering away on a pattern for an iPhone holder, but every time I tried to work on it I'd decide that actually it needed redesigning and then a custom order would come in and somehow the pattern kept getting pushed to one side...somehow this process ended up in there being 8 different prototypes, but happily the deliberation is all over now and the pattern has been tested several times over and I have made four lovely iPhone holders from the final version and am hoping that it's as easy to follow as I think it might be. And on the reverse it has a credit card holder that fastens with a velcro tab. On the front there's room for some fabric loveliness and for a name or initial to be embroidered on to personalise the holder. 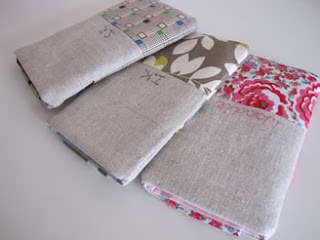 In the process of pattern testing I've made up some of these to give to my lovelies who said that they were without iPhone holders: Leanne, Ian and Sam. 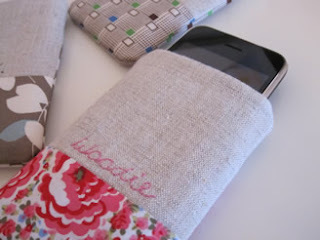 My last pattern was called The Tabitha Bag and I knew from the start what I was going to call it, but I was a little stumped by this, but in the end decided to call it the Lis iPhone holder, using the initial of each of their names because it makes me happy to have named it after them because they really are all such dear people (Leanne likes to be called Woodie...just in case you were thinking that I may have embroidered the wrong name on)....this could be a dangerous method for naming, no? This morning I made up one more for Zebra girl who borrows Mr Teacakes old iPod Touch...it's a little shorter and slimmer than the iPhone, but it's still a really good fit (UPDATED: I think the most recent 2011 version of the iPod Touch has a smaller circumference and so consquently the Lis may be a little too wide for it to fit without some adjustment. It continues to be a good fit for all versions of iPhone though). 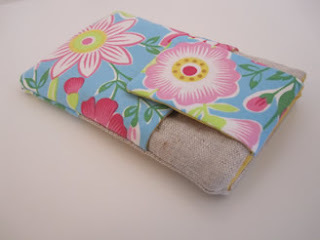 She is yet to see it, but I was hoping that she would like the bright, zingy prints...and perhaps she will use the pocket for secret notes rather than credit cards. While it may be helpful to print out the instructions, the iPhone holder is made from a series of rectangles and so a printer isn't necessary for printing out any pattern pieces. If you follow the instructions carefully and cut with precision, then this pattern should be challenging, but perfectly do-able, for a relatively new sewer. 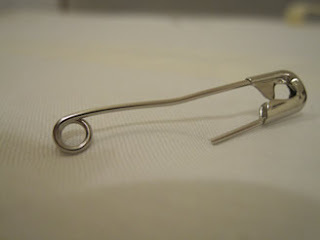 The PDF can be downloaded instantly, so you can get straight on with making the holder. 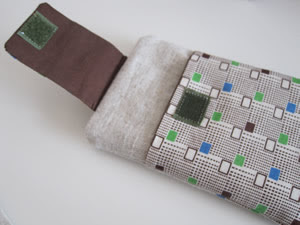 The PDF pattern costs £6.50 (that's approximately $9.50 USD), and this price includes the right for small-scale sellers to sell any iPhone holders made from this pattern. The cost of this pattern is non-refundable. I'm really hopeful that you won't, but if you do find yourself struggling with any aspect of the pattern, then please do email me - I want to help. If you do make any iPhone holders from this pattern then I would absolutely love to see photos of them, if you have the time/inclination to send me any! UPDATE: Apple release new phones annually, and I believe this pattern may now only be suited to those of a similar size to the iPhone 4. Subsequent phones, such as the iPhone 6, have very different dimensions and this is highly unlikely to fit them. A post of mainly pictures due to my having lost the ability to talk, write or do anything other than hibernate. The result of a busy week of sewing that ended with the most lovely of birthday weekends: an amazing evening at the ballet with my family to celebrate mine and my sister's birthdays, birthday cake with the little Teacakes and then dinner, a magic show and late night chatter with good friends and Mr Teacakes while the small ones stayed at their grandparent's. I have been spoilt with the most beautiful fabrics, colourful macaroons, scrumptious bath treats, a wonderful poetry book and perhaps most excitingly of all, our friend Ben arrived bearing handmade truffles (the note on the tin said that they had been 'handmade by artisans in Stockwell'...they are nearly all gone, but I will keep the label as it makes me laugh). There is also a new mannequin in my life...one that is actually the same size as me this time, but more on that in another post as it's too exciting to squash in here. 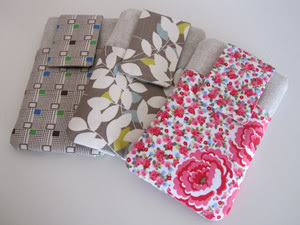 The fabrics are by Heather Bailey. I have decided that she is my very favourite designer - I love every range that she's ever done even more than the last. 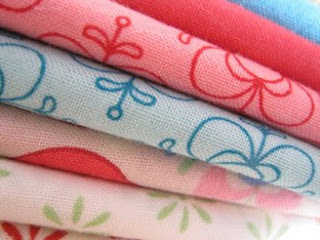 These came from overseas and arrived just in time for birthday unwrapping...I am so excited about sewing with them. The bottom one of these will be turned into a summer skirt for myself. Which should be all the easier to make with the help of the new book that I was given by Mr Teacakes. It's called How to Use, Adapt and Design Sewing Patterns . 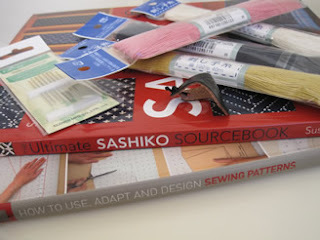 I'm really excited about it - it is wonderfully geeky and goes into lots of detail...I've noticed that dress-making books tend to be much more satisfying to own than regular sewing books as they get into the nitty gritty of sewing so much more readily. I think it's the perfect follow up to Cal Patch's book that I raved about here. Mr Teacakes also bought me some Japanese Sashiko threads and needles, a leather thimble and The Ultimate Sashiko Sourcebook ...I have so many ideas for how I might incorporate some sashiko into summer handbags - I wish there were more hours in the day...I have been told that in four months I will be 1/3 of the way to 100. Damn. Those of you that are long-time readers may remember that Mr Teacakes always makes me a birthday cake...there have been sewing machines and other stitch-related themes. 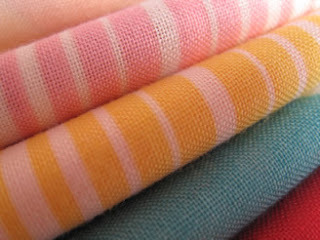 This year was a patchwork quilt in four shades of pink. It tasted delicious. It was a most appropriate cake as last week, inbetween making up custom orders, I finished the double quilt that I was making for our bed (although this is white and cream...and not pink at all). This morning I woke at 4am and lay awake waiting until the sun began to shine through the curtains and then I allowed myself to very quietly make the patch that will be sewn on to the corner of the quilt to finish it off. The house felt cosy, full of sleeping guests, and I had the most lovely couple of hours happily hand-stitching in bed next to a slumbering Mr Teacakes and feeling that Spring must truly be about to arrive now that it is getting light so much earlier. Later Mr Teacakes made vast amounts of croissants and scrambled egg and for once I had breakfast (which I normally dislike) and felt thoroughly birthdayish. Such a lovely weekend.